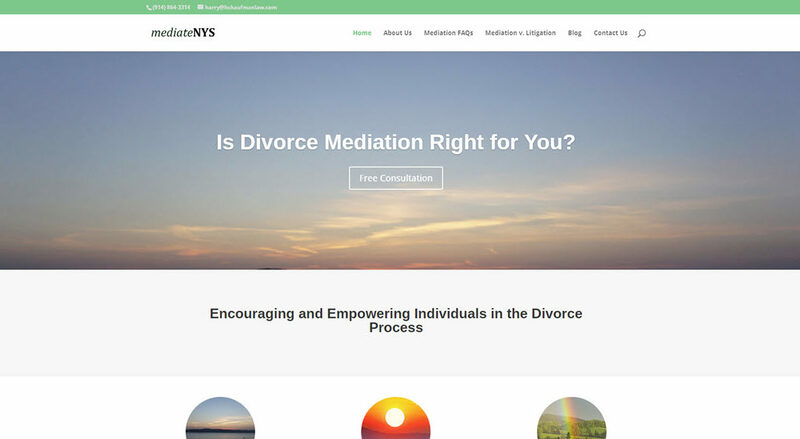 We recently completed a brand new website for divorce mediators Harry and Jacqueline Kaufman, who work under the name Divorce Mediation Associates of New York. Harry and Jacki wanted a platform on which they could promote their services and blog about divorce mediation. We created an appealing, mobile-friendly and simple-to-navigate WordPress website using the Divi theme from Elegant Themes. We like Divi a lot because of its easy of use, flexibility, and solid reputation. The site makes it very easy for a person to inquire about the Kaufman’s services, via phone, email or online form. We helped the pair on image choices and overall site appearance. The couple chose GoatCloud to host the website and to provide out managed WordPress services, where we keep the site software current, back up the site regularly, and monitor it for performance and security issues. Check out Divorce Mediation Associates of New York here. Update March 2018: We have also helped Divorce Mediation Associates with Google AdWords and to start using Mailchimp to send out email newsletters.